Known as Mandalay House, the home is located near the Whitsunday Islands. This spectacular property includes a marina, a helipad and a swimming pool with views of the Coral Sea and is currently on the market for £10 419 000 or around R245 302 262! 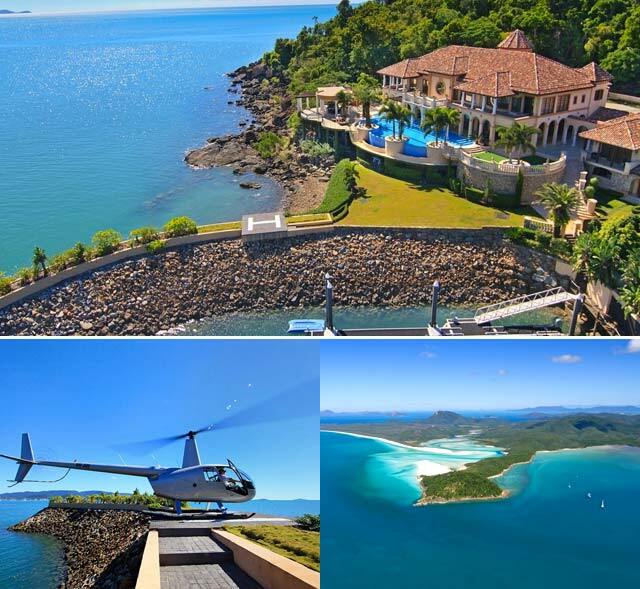 This estate is on Mandalay Point near the Whitsunday Islands, not far from the Great Barrier Reef. 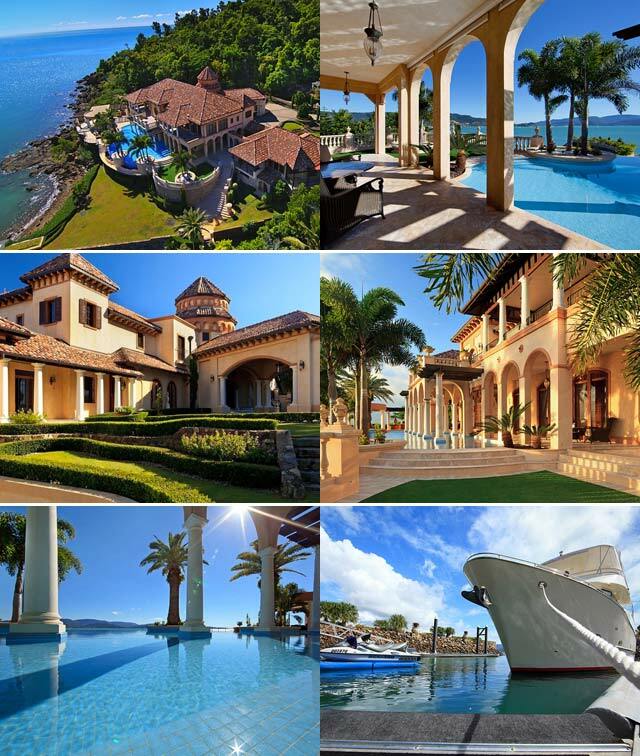 The Mediterranean-style, 28,500-square-foot home overlooks the Coral Sea. The estate belongs to Australian property developer Neil Murray, who purchased the land in 2001. Murray is selling because he bought another house to be closer to his family. During the two years it took to secure various approvals and permits, Murray traveled extensively with his architect and interior designer, gathering inspiration and materials to build the home. Construction took 3½ years and was finished in 2006. With spectacular views, private marina, Mediterranean inspired architecture and unrivalled luxury features throughout, Mandalay House is a dream home on the beautiful Whitsunday Coast, located at the heart of the World Heritage Listed Great Barrier Reef in Queensland, Australia. The owners worked with an open cheque book alongside their architect Andrew Simpson from Total Project Group, who specialises in Mediterranean style resort architecture. Andrew excels at picking up views within views. When you walk through the home it feels like you're looking through a picture frame, every detail has been considered with unobstructed vistas from every angle. 'Mandalay House' took 3.5 years to build, nothing was overlooked during the construction period, with high quality artisans and materials sourced from overseas and Australia. The owners have travelled extensively and drew direct inspiration from homes in Nice and Monte Carlo, they were passionate about ensuring the building materials honoured the Mediterranean style of homes, the patina of every surface and construction of the home was crafted to ensure the building gets better and better with age. The architect and his interior designer partner travelled through Europe for inspiration prior to the build phase and they purchased exact furniture to suit the shape of every room.The property is opulent, a sequence of increasingly rich interiors, reminiscent of the Baroque period with most of the antiquities originating from Italy and the United States.The horizon swimming pool feels like it's part of the home, when you walk through the interior you get a constant glimpse of the pool from every room, it literally feels like it's inside the home, on the ocean side wet edge runs off continuously into the Coral Sea. Features a climate controlled cellar with dining for 12, cinema, gymnasium, garage, staff quarters and utilities.Main LevelEnter the home via a magnificent hall with spiral staircase and feature windows looking out over the bay, this level features a gallery, living rooms, dining, kitchen, studio office and pool access. This level includes the 144m2 mater bedroom with private sitting area and 52m2 all-in dressing room. There are 4 guest bedrooms, all with ensuites. A generous shared balcony runs the length of the building to make the most of the magical ocean views.